This is my first mounted figure. So far , finding a decent 1/6th horse has been the real problem : there isn't one available. The only commercial offerings are crude in the extreme , and I've had to do a great deal of rebuilding work to produce something acceptable. So , until someone makes a good horse , we are stuck with whatever we can find. This one is the DiD hairy version , skinned and given a new head and a major body resurfacing. 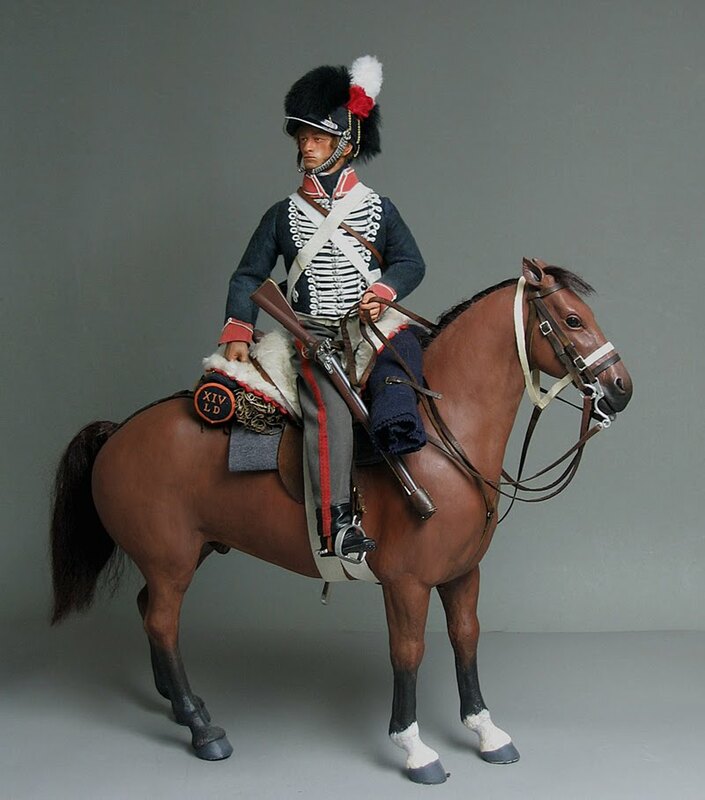 The British Cavalry in the Peninsular War suffered somewhat from Wellington's spleen : never an easy man to please, he seems to have had a prejudice against them . Nonetheless , they did the job pretty well , with a few disasters like Campo Mayor; but it's worth pointing out that with the exception of the occasions when they charged too far , or into an invisible ravine , they beat the French Cavalry on every occasion they came up against them : quite a record. 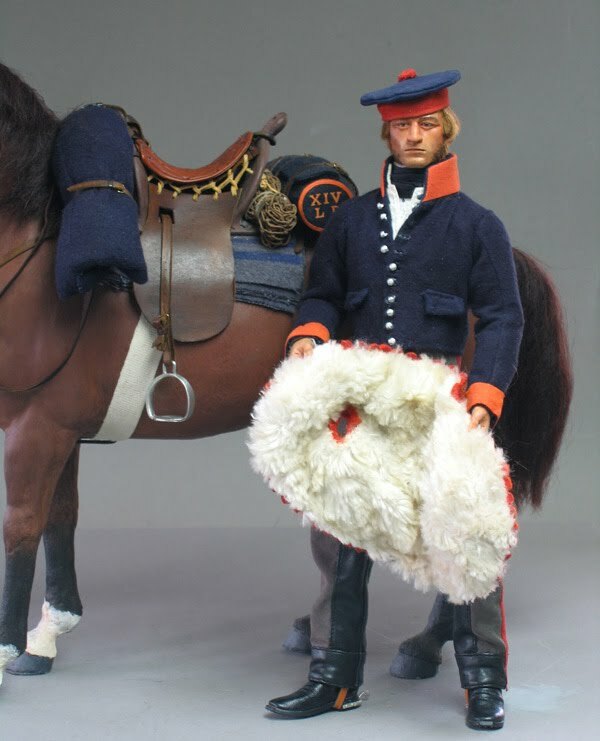 My figure is from the longest serving unit in the War : the Fourteenth Light Dragoons. Present from 1809 until 1814, and at most of the major actions. The 14th wore the old uniform , the favourite of George III. I beg to share the King's taste : The Tarleton helmet and blue jacket is one of the neatest outfits of the period , and it also had the advantage of being distinguishable from a distance , and has a distinct national character, unlike the French- inspired outfit with a shako that officially replaced it from the end of 1812 ( the Prince Regent's choice ) . In fact , that uniform was probably not issued until their return home at the end of the war. The helmet is boiled leather , with all the fixtures wired on. 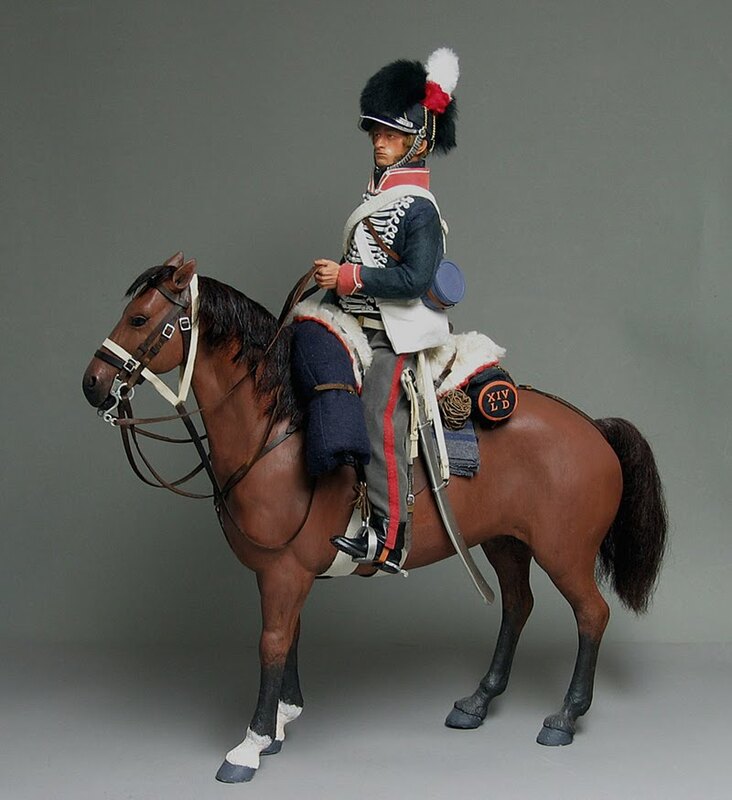 Original troopers' versions don't survive, but fortunately they were also popular amongst the Yeomanry , and I've had a good look at a surviving one. 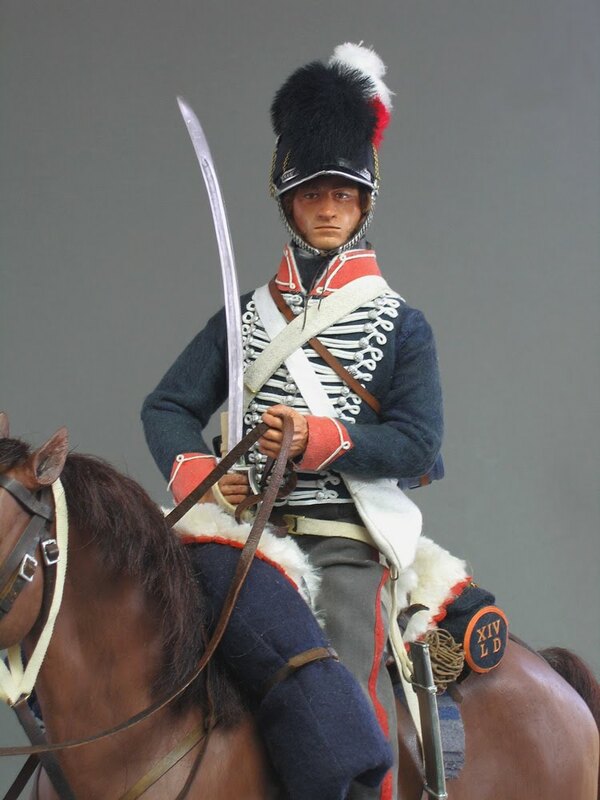 The jacket has gradually assumed the cut and decoration of a Hussar dolman , but unlike their sister regiments of Hussars , the Light Dragoons eschewed the rest of the frippery associated with Hussar uniform. He's armed with the 1796 light Cavalry sabre , a very good weapon , and an Elliott carbine and a pistol. These firearms were as much for show and firing warning shots when on piquet duty as anything , since the carbine was inaccurate beyond 60 yards , and the pistol beyond about 10. On the saddle are carried his cloak , over the holsters , a valise carrying his spare clothing , and a forage net for feeding the horse. The carbine is carried in a bucket on his right side , and could be clipped to his carbine belt for quick access. He wears the haversack and canteen for food and drink over his right shoulder, worn as high and tight as possible to prevent them moving about. 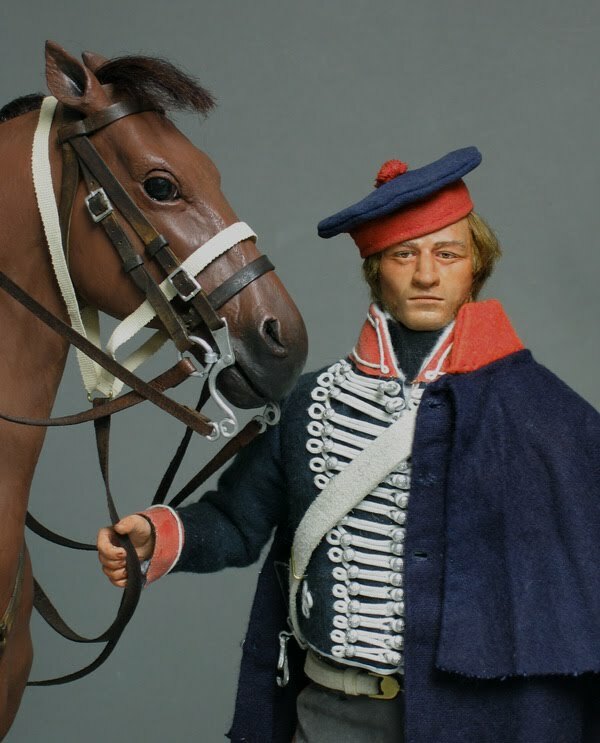 Our Trooper wears his stable jacket and forage cap for saddling up. The bridle is the simpler type used from the late 18c. Many Regiments started to use the more elaborate Hungarian style bridle during this period, but I've stuck with the old type. The white webbing object is the halter , used for leading the horse about when feeding or watering. 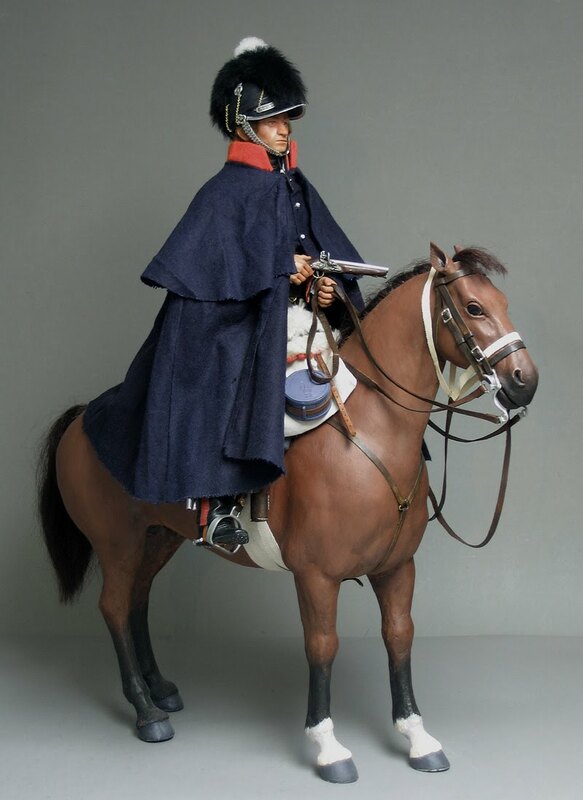 Most of the Cavalry's work was piquet duty : they were the eyes and ears of the Army , constantly shadowing the French and sending intelligence reports of their movements. This involved very long periods of extreme boredom and discomfort.